Think Tank seem to get good reviews, but never seen one!! PS Must ask my local shop where my TGOs are, they seem to have stopped!! For those who just carry compact cameras in cases with thin carrying straps which can be uncomfortable under rucksack straps, a good way to carry them is by creating a simple loop in the strap to make it shorter and fastening it around the waist. Simple but effective. 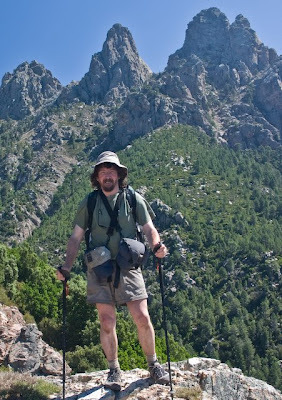 I have to confess that during my own PCT hike I simply slung my D-SLR over my shoulder, on the supplied strap. During rain I'd stash it into a drybag in my pack but it spent most of the six months hanging loose. On two occasions the strap broke - both times at the thin piece of webbing where it attaches to the camera - it'd been worn down by the constant bouncing on my chest. Fortunately on both occasions I was wearing my pack and the rest of the strap was caught beneath it so though the cameras swung wildly the pack caught it and it never hit the ground. The camera does still work perfectly though the lens suffered from occasional moisture ingress once I got into more humid Oregon and Washington. Congrats by the way on the OWPG award Chris - great piece to win the award for too. You're a braver man than me John! Actually when I expect to be taking pictures frequently and I'm on a good path I do carry my camera out of the bag. PS - the newsagent hasn't dfelivered a TGO since August, yet still on books, not charged me, thankfully. When is the last date to get a copy of the article? We have kept the dealer locater in the chance that you local dealer might have the case you require. " Thanks Nick. Useful to know they still have stock.